The Thursday before Easter saw a frenzy of mad young scientists invading the Library. 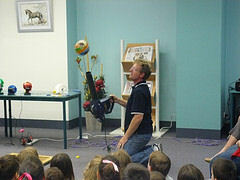 Back by popular demand, Darren from Fizzics Education presented the 'Big Science! Big Fun!' one hour presentation. 80 kids enjoyed the presentation which included the wonders of liquid nitrogen, the amazing hover board and experiments using sound and air. The most enjoyable part for the Kids was saved for the finale as the Kids watched the floating toilet paper glide through the air. 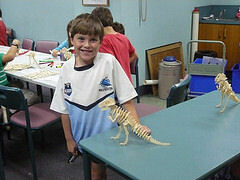 Darren had some lunch and afterwards guided a group of Kids through 'Construct-a-Dino'. The Kids had a brief lesson on the history of dinosaurs before launching into making their own T-Rex. The wooden kits required the kids to use both their concentration and their fine motor skills. The skeletal finished product was quite delicate and the Kids very carefully carried them home. Each school holidays, Sutherland Shire Libraries hold a bundle of seriously fun activities for Kids (just between you and me, they are so much fun they make me wish I was still a Kid). To find out more about upcoming activities keep an eye on our events calendar. Author and Child and Family Therapist Kerry Moss will be giving free information sessions for parents wanting to know more about helping children manage anxiety. Kerry has 7 years of clinical counselling experience. She has developed programs to help children with confidence and has a primary focus on working with families who struggle with anxiety. 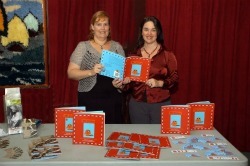 Kerry has written two books - Mr Jitters to help families and children aged 4-9 with anxious moments and Speech Day Jitters to assist children aged 8-13 with performance anxiety. These sessions are free but bookings are essential. Book online for the Engadine or Menai session or call Library Services to secure your place today. Sutherland Shire Libraries will be running free Information Sessions for anyone interested in knowing more about the new 'Save Power kits' available to borrow from the libraries. 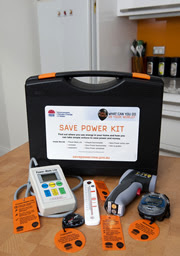 You can now borrow a 'Save Power Kit' from the 8 library locations within Sutherland Shire. The kits are part of a NSW Government initiative to encourage everyone to be aware of their power consumption and take steps to reduce it. The Save Power Kits can show you what uses the most power in your home, and give you ideas and some easy steps you can take to save money, power and reduce our impact on the environment. We had a fantastic Youth Week 2011 here at the Sutherland Shire Libraries, with many teens and young adults gracing our doors to participate in loads of activities, including Wii Gaming Nights with pizza and snacks, a movie night showing 'Edward Scissorhands' and a HUGE clothing swap just for teens! We even had our own spray tattooist on hand to give kids temporary butterflies, roses, Justin Beiber and Darth Vader tattoos. These were a real hit and even some of the staff sported a few for the week. Check out the great pics we've added to our Flickr account - have a browse and be on the lookout for more great activities for teens in the shire! Infobase E-books great for students! It's exam and assignment time for uni and senior high school students and what better way to help you study than to access our Infobase E-books. Our growing collection of E-books covers a wide variety of subjects including Ancient Greek and Roman history, Literature (novels and plays), health and medicine, religion and biology. Users can browse the collection by subject or search the E-books by title or full text. Each E-book is displayed with a zoom feature, meaning you can make the text larger and smaller to suit yourself. You'll be able to jump to chapters from the front page and search within the book. So why are these great for students? Most of our E-book titles are relevant to students studying HSC and selected university courses such as English, Ancient History and Biology. You can sign up for a free 'My Notebook' account (all you need is an email address), which enables you to record notes, bookmark and highlight pages in the text. You can sign in at any time to access your notebook. Each Infobase E-book comes with citations in MLS, APA and CMS. We all know how important it is to get all the citations correct in your university assignment, so this is a great tool to help you. Not sure what that word means? Not to worry! Now you can quickly and easily look it up using the Infobase dictionary - it's all so easy to use. So now that you know about these great new e-books, try them out today and tell us what you think. For more information on using Infobase E-books see this online video. On Tuesday the 12th April 30 excited children of all ages converged at Caringbah Library to participate in our amazing science school holiday activity which was full of fun and "Surprising Stuff"!!!!! Children and staff alike tested their co-ordination skills with "My Aunt Came Back" song and action rhyme. Memories were put to the test with the "Memory Game" and "What's in the Mystery Box" had the children guessing??? The Wizards Bubbling Brew and Slime experiments had the children intrigued and mesmorised with many asking for a copy of instructions to make their own at home. The kaleidoscope craft was a great hit!. The books "Pop the invention of Bubble Gum" and "No its a book" were enjoyed by all. The activity was a great success!!! The Children's Book Council of Australia have announced their short list for Book of the Year 2011. Each year, judges read masses of books for children choosing six nominees for each category. They do all of this in just 10 months - what a job! The winners for each category are announced during Book Week (this year being held from 20th - 26th August) - a week where schools and public Libraries across Australia celebrate all things bookish, including the book week winners. Now without further ado, here is the short list for 2011. Noni the Pony by Alison Lester. I am not a morning person. The one and only day of the year that I am motivated to get up before sunrise is on Anzac day, to attend the dawn service, along with many others. In fact, each year thousands of people ranging in age from the elderly to the very young, gather at War memorials around Australia, attending various commemoration services to pay their respects to the Anzacs- whose courage and bravery is legendary. This year commemorates the 70th anniversary of the Seige of Tobruk and Battle for Greece and Crete. Sutherland Library Service offers a comprehensive collection of information resources for all ages about these battles and other events relating to Gallipoli and Anzac day. There are simple junior non fiction books to share with your children and grandchildren, as well as wide range of other items available for loan to any interested library members. So although the library will be closed for the Anzac Day public holiday, do make time to come into the library before then and discover more about this very important part of Australian wartime history. Book your baby in for Lapsit! Bookings for our Lapsit program in terms 3 and 4 are now open. Lapsit is a four week program designed to introduce babies (6-18 months) to books and rhymes assisting in the development of early childhood literacy. The program consists of four weekly sessions in which babies and their carers join us for rhymes, fingerplays, songs, puppets and simple board books. Each session ends with an informal information time for carers. 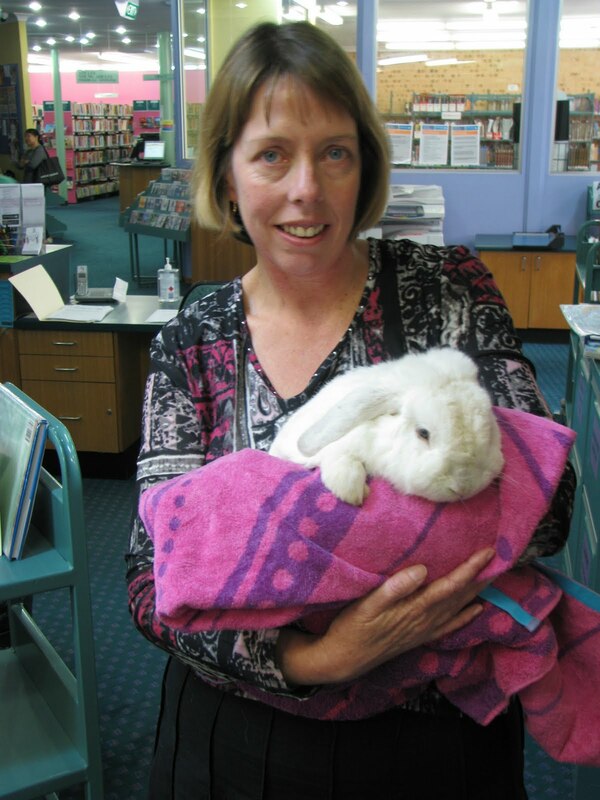 Engadine Library had a special visitor for their Easter Storytime last Friday morning. 40 delighted children were able to give Nibbles the Easter Bunny a friendly pat before they headed off to make their own Easter baskets. Don't forget that Storytime resumes at Engadine Library on Friday 29th April 2011. Anita Heiss, author of Paris Dreaming, will be presenting a talk and book signing event at Cronulla Library on 12th April, (which is this Tuesday evening), come along to find out more! Anita answered five questions in five minutes for us, here's what she said. 1. What are you reading right now, are you enjoying it? I’m currently reading Lisa Heidke’s Claudia’s Big Break. Set in Santorini and focussing on close personal relationships – with friends and lovers – it reminds me of my time in Greece some years ago, and also the shared experiences we have as women in relation to matters of the heart. 2. Tell us a bit about your favourite book. One of my all time favourite novels is Terri Janke’s Butterfly song . The book is a love story, a legal lesson, a comment of the contemporary lifestyles and responsibilities of young, educated Indigenous people today, and a treasure-trove of eloquent and elegant writing. Narrated by Tarena Shaw, soon to be graduate of law, Butterfly Song as a romance novel tells the love story of Tarena’s grandparents - guitar man Kit and Francesca his frangipani princess, and how their eternal love is symbolised in the butterfly brooch carved by Kit for his lady. Butterfly Song is also a crime novel as the brooch was stolen in the past, which leads Tarena to research and defend her first case, without yet receiving her uni marks. In terms of learning about aspects of the law, Butterfly Song is a gem of a text, as we also get a simple lesson in native title and the Mabo decision, while learning of the angst of Indigenous law students dealing with prejudice and ignorance in the university environment. I think it’s a great role model story for young Australian women. 3. What do you like to do when you are not writing? I write every day but when I’m not doing that, I’m exercising (at the gym or walking locally in whatever city I am in), or catching up with friends and family, shopping, eating chocolate, enjoying the sun. My next novel revolves around the lives of five Aboriginal women born and raised in Mudgee (NSW) who find themselves in their 40s all living in Brisbane. The story focuses on the joys and challenges of life-long friendships and personal and societal expectations on women. 5. If you could have dinner with two famous people who would they be & why? I’d love to have dinner (but someone else would have to cook) with Oprah because of her extraordinary life story and positive outlook on life. She is the reason I keep my gratefulness blog. I’d also like to dine with J. K. Rowling, another amazingly talented and accomplished woman whose life journey hasn’t always been glory and glamour. Of course, I’d be asking her for writing tips over dessert! Book into Anita Heiss’ author talk here. Stephanie Plum series by Janet Evanovich. A very funny series featuring a female bounty hunter, named Stephanie Plum. Read about her antics in a series of seventeen books, starting with “One for the money” (or if you’re already a fan, place a request for the latest instalment “Smokin Seventeen” on order at the library now). “One of our Thursday’s is missing” by Jasper Fforde. The sixth book in the comic fantasy series, Thursday next. Includes plenty of parody, puns and wry observations about the literary world. “Skipping Christmas” by John Grisham. Something different from his usual legal thriller, the title says it all. “Catch 22” by Joseph Heller. Published in1961, this is a classic you may like to try. It’s a comedic attack on military establishment that has survived the test of time. “Small Gods” by Terry Pratchett. This is the latest hilarious instalment of Sir Terence’s comic fantasy Discworld series, consisting of 39 novels, 6 short stories and more. Read all about Discworld, and meet all its wacky characters- witches and wizards, gods, Death, trolls and a librarian who has been turned into an ape. “Bridget Jones Diary” by Helen Fielding. Seen the movie? Now read the book (before you watch the musical) The original, laugh out loud, chick lit novel. “Confessions of a Shopaholic” by Sophie Kinsella. Another one for the girls! If you like shopping you’ll love these books! They follow the hilarious life and shopping adventures of Becky Bloomwood. The latest release is “Mini Shopaholic”. So, what books make you laugh out loud? HSC Lecture Series 2011 - Bookings now open! Larry Grumley is a head English teacher, study guide author and HSC marker. Larry will share his expertise on answering English Paper 1 - Area of Study - Belonging. Please Note this lecture is booked out! Poet Peter Skrzynecki talks about his series of poems - Immigrant Chronicle. The poems are a set text for the HSC English Area of Study - Belonging. Stephen Dixon is a former head teacher, Modern History textbook writer and HSC lecturer. Stephen will share his wealth of knowledge and experience on the World War 1 core topic together with invaluable HSC exam tips. This talk will be presented by Neil Kusi-Appauh, who is head teacher at Illawarra College and has extensive experience as an HSC senior marker in Legal Studies, is a member of the Legal Studies syllabus writing team, HSC Lecturer and has authored Preliminary and HSC Legal Studies texts. Bill Bourke is an experienced Business Studies Head Teacher, HSC marker, lecturer and tutor. He presents a lecture which covers subject content, with hints and tips on how to maximise your HSC marks. Tickets are $5.00 and bookings can be made online, over the phone by calling 97100351 or in person at any Sutherland Shire Library. These lectures are very popular and sell out fast so get in quick to reserve your spot. For more information and to make a booking, see our Events Calendar.